We are fully equipped to provide cleaning of all internal food tankers and chemical tankers. With our purpose-built, state-of-the-art washing facility, we recycle all of the water that we use. We use only environmentally-safe cleaning agents. 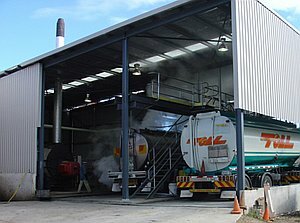 In addition to these washing facilities, we have electrical and steam heating services to clean fuel tankers and food grade tanks. For more information on any of these services or a no-obligation quote on what products and services we can deal with please contact us, we would be more than happy to help.